Similar to our popular X-Men Timeline of Events, we’ve gone ahead and done one for the Ol’ Webhead himself. 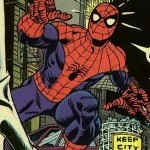 This list details the major happenings that have a lasting effect on Peter Parker, which are either still in play today, or at least changed Spidey’s world for a significant period of time. SPOILER WARNING! If you haven’t already guessed, this list of events will spoil what happens in Spider-Man comics. The dates listed below are in relation comics published this year (2013) are current, extrapolating from that point using Marvel’s loose 3-or-4-years-to-one rule. Also included is Peter’s estimated age. Peter’s Age: From about 15 to 17 years old. In these classic first Spider-Man stories, Stan Lee and Steve Ditko do something completely unseen at the time, a teenage superhero who doesn’t always win at the end. Most of Peter’s most important villains and supporting cast are all introduced very early on. Peter’s Age: about 18 to 19 years old. Peter graduates high school and enrolls to Empire State University. He meets his future bestie Harry Osborn, his future Girlfriend Gwen Stacy and meets his future nemesis, Norman Osborn (whom he met as the Green Goblin prior to this) as they are both unmasked. At this point, Ditko ends his run with the great “If This My Destiny” and few issues to spare, and John Romita Sr. joins and slowly makes the characters his own, giving us the definitive Gwen Stacy image. We also finally meet Mary Jane Watson, whose introduction creates probably the most revered love triangle in comic book history. 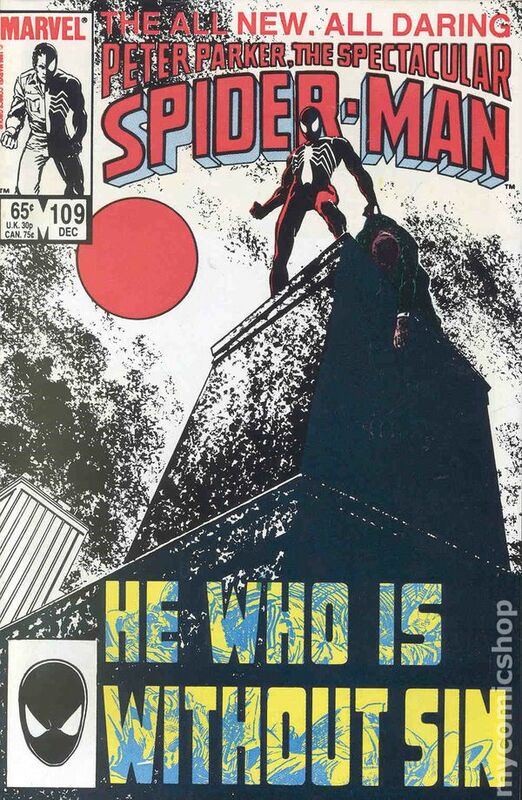 The first and still most popular story in which Peter gives up being Spider-man, only to have his mantra of “With great power comes great responsibility” compel him to return, this story by Lee and Romita Jr is a masterwork in single-issue storytelling, lost to modern storytelling. Peter’s Age: about 19 years old. While it may be the Silver Age, I would consider this the golden age of Peter’s supporting cast. Harry and Peter are best friends, Flash becomes a reluctant friend of Pete’s, and the MJ-Gwen love triangle is at a peak. Gwen’s father, Captain George Stacy gets introduced, and plays an important role as a father figure to Peter, and adds intrigue as well as his fascination with Spider-Man is another layer to the overall story. Alas, the memory of Captain Stacy is larger than his life, as he meets his demise too soon during a battle between Ock and Spidey. His last words are very important to Peter’s motivation, reaching near origin-level significance. After Gwen returns from London following the death of her father, she and Peter begin to get serious (when not interrupted by growing four extra arms!). 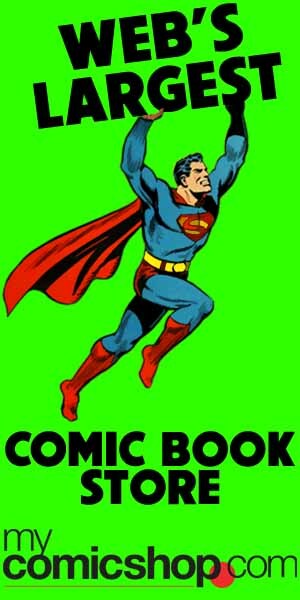 MJ and Harry, however, don’t gel, which leads to his drug problem and then the return of his father as the Green Goblin. 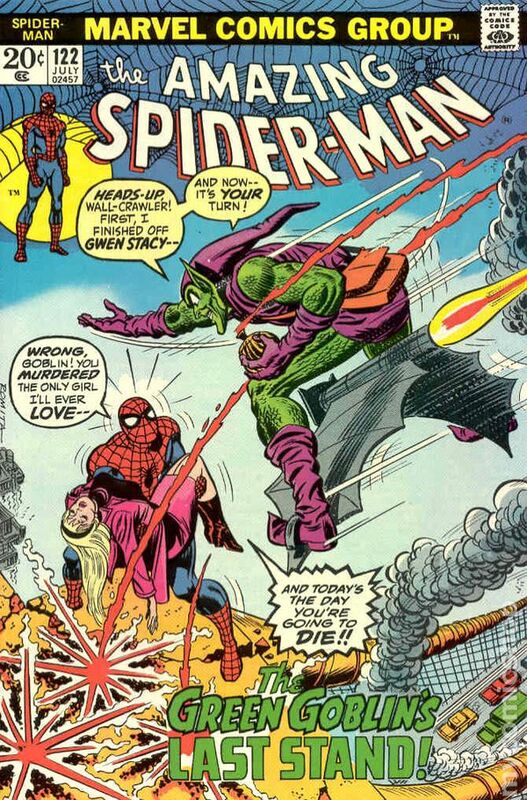 A battle between Green Goblin and Spider-Man results in the death of a kidnapped Gwen Stacy, who Spider-Man just fails to catch in time from her plummet for the George Washington Bridge. Norman Osborn, the Green Goblin, meets his demise soon after. Peter’s Age: about 19 to 20 years old. Intertwining with the events of Gwen’s death, Spider-Man had been on a mysterious chase regarding the whereabouts of Aunt May. Little did he know that Aunt May, who had befriended Doctor Octopus previously, was set to marry him, all in his ploy to inherit an island with precious scientific resources. Also, following the events of Gwen’s death, the romance between Peter and MJ begin to see sparks, as she drops her “Party Girl” facade. Peter’s Age: about 20 years old. In what now seems almost too soon, Harry becomes the next Green Goblin, and Gwen Stacy returns, though as clone. She was created by Miles Warren, a professor at ESU who had loved Gwen Stacy. 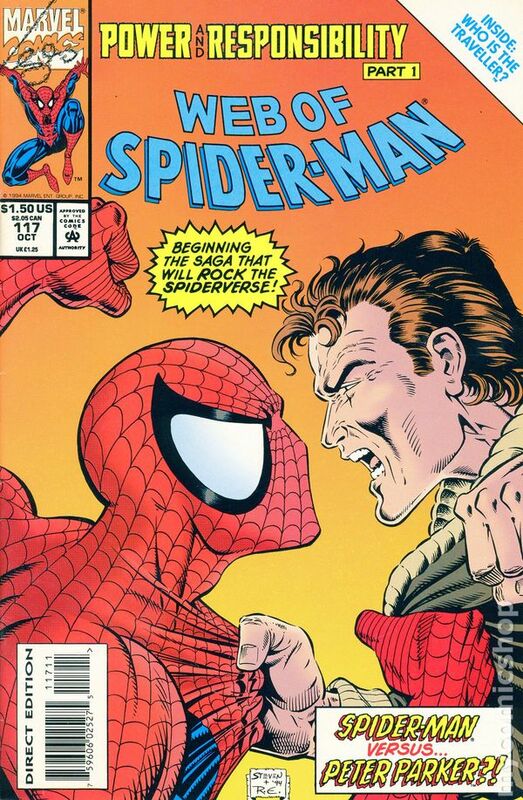 As the Jackal, Miles plotted his revenge against Spider-Man, which culminated with a battle between Spider-Man and his clone. 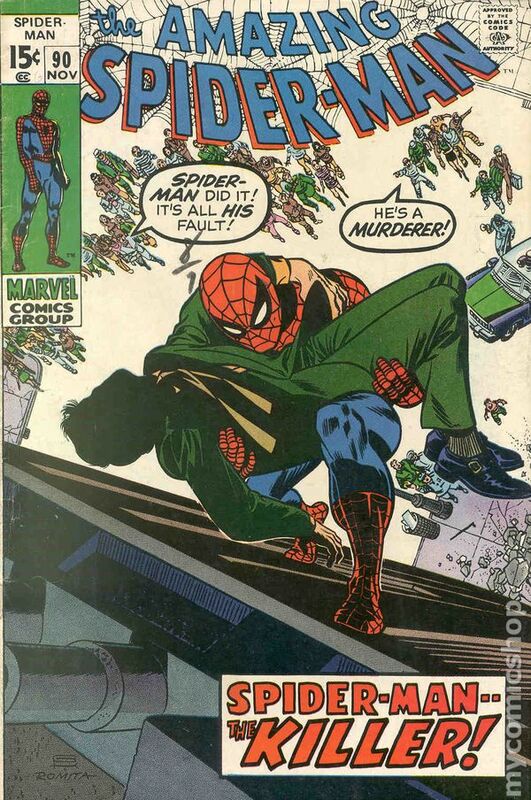 Peter dumps the clone’s dead body into a smokestack, which will come back to haunt him many times over over the course of the next few (publisher) decades. Peter’s Age: about 21 years old. 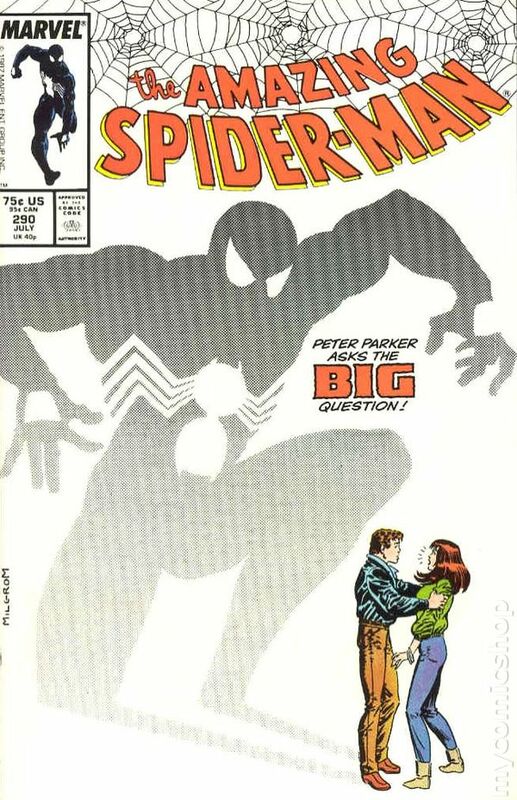 First in a series of possibly life-changing events, Peter proposes to MJ, only to be rejected an issue later, which will eventually lead to having MJ leave the series for a good while. Soon after, Peter graduates from ESU, moving on to his graduate degree. 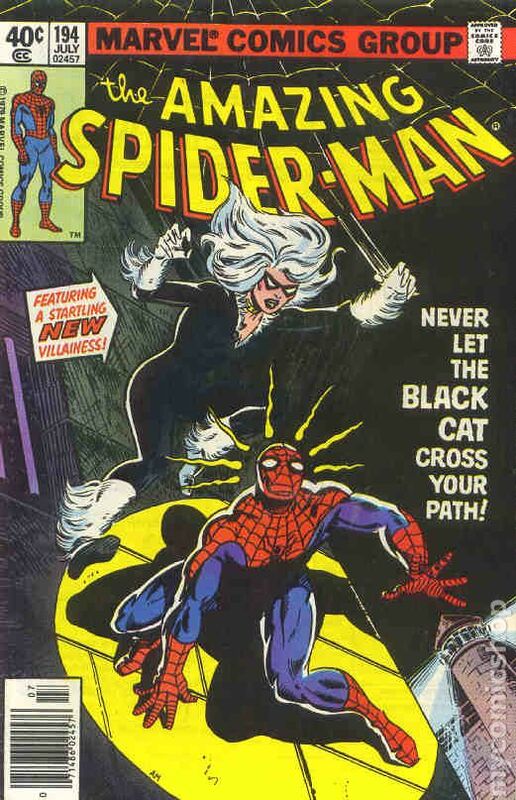 These two events lead to a renewal of the supporting cast, with the introduction of Peter’s next flame, Deb Whitman, as well as the popular Black Cat. 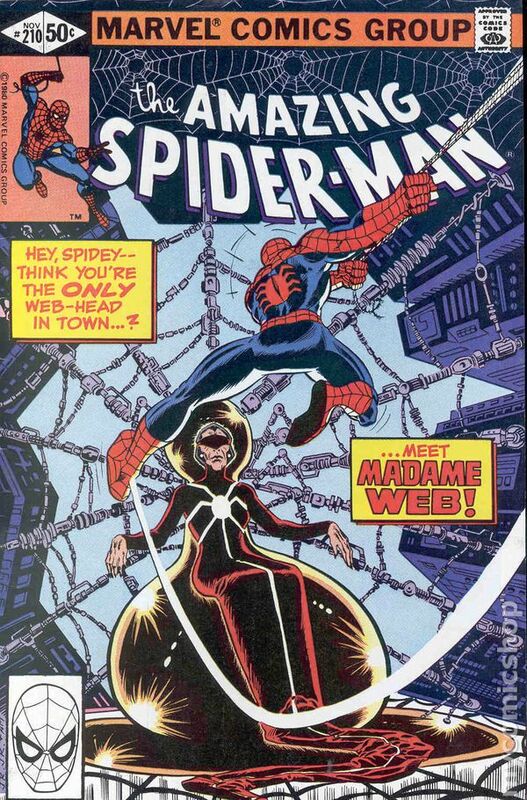 Madame Web, a psychic, contacts Spider-Man, which brings about some of the top rated issues of the series, such as Spider-Man’s confrontation against the Juggernaut. Meanwhile the Black Cat returns and professes her love for Spider-Man, though her criminal history always gets in the way. Peter’s Age: about 22 years old. Deb Whitman breaks up with Peter after being into believing he isn’t Spider-Man. 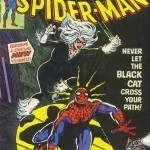 Just then, the Black Cat returns quickly sparks up a relationship with Spider-Man. Concurrently, a mystery man discovers the Green Goblin’s stash and takes on the name of Hobgoblin. This mystery would leave readers guessing for years, with different writers continuing the mystery after Roger Stern, the original architect, left the book. Madame Web ropes Spider-Man into confronting the Juggernaut in what is considered on of the best Spider-Man stories. 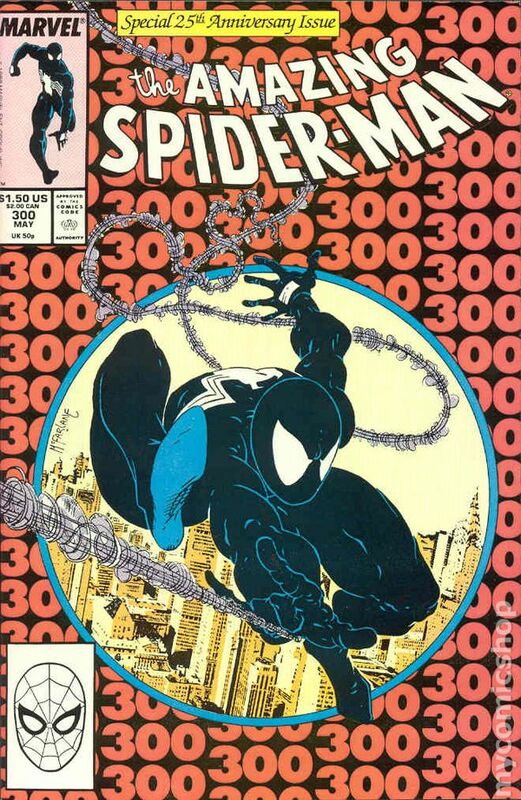 Spider-Man brings back the black costume from the Secret Wars, without knowing it is an alien symbiote. On the relationship front, Spider-Man reveals his identity to his girlfriend, the Black Cat, who is taken aback by his civilian life. The Black Cat secretly gets “bad luck” powers from the Kingpin. MJ returns from New York and reveals she knows he’s Spider-Man. 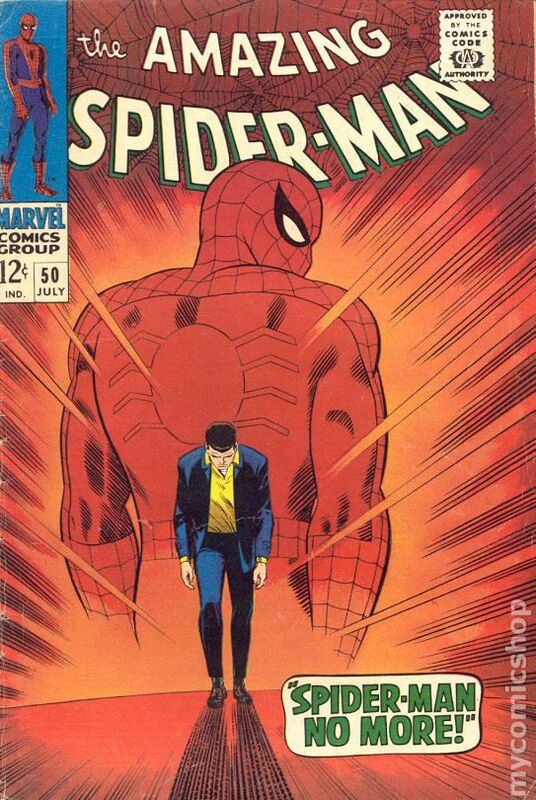 This still remains one significant death in Spider-Man lore, despite not being as close to “Peter”. It helps that this story remains one of the best Spider-Man stories, which stands on its own without the significance of the death. Also significant is the development of Daredevil discovering Spider-Man’s identity. Peter’s Age: about 23 years old. This is one of those periods where we get a dense amount of important story, as storylines wrap up with major reveals, while others pop up in aftermath. 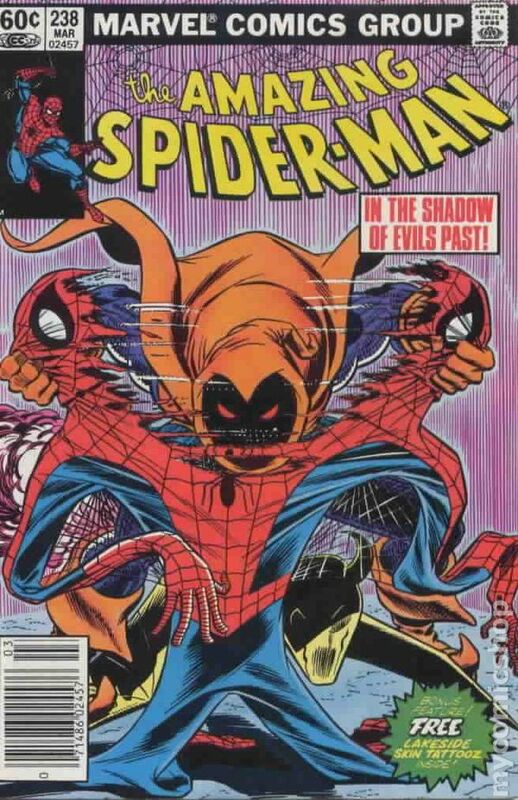 The mystery of the Hobgoblin had been running for the past few years, with suspects such as Flash Thompson, Roderick Kingsley and Ned Leeds surfacing. The latter is revealed to be the Hobgoblin, but only after his death. 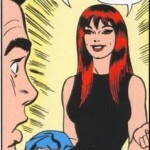 Soon after, Peter proposes a second time to MJ, who accepts this time. They marry nearly immediately (there goes the floating timeline! 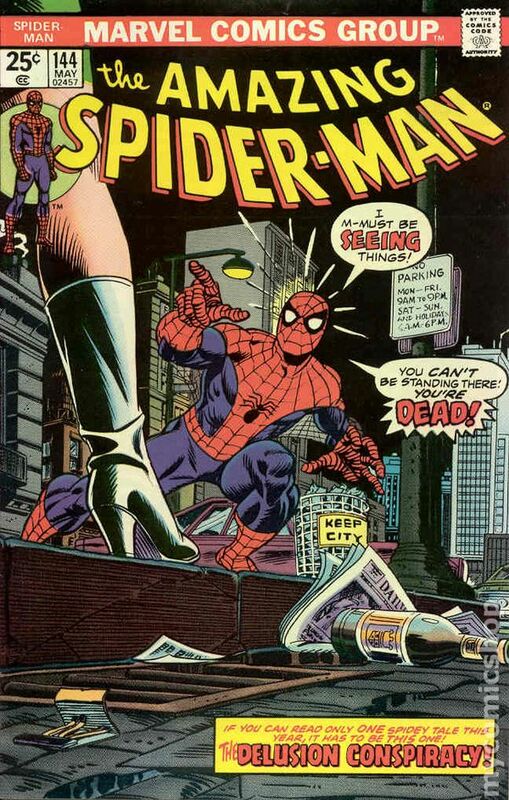 ), but married life afterwards get very dark very fast as Kraven buries Peter alive, and then takes his own life after having completed his life goal of beating Spider-Man. 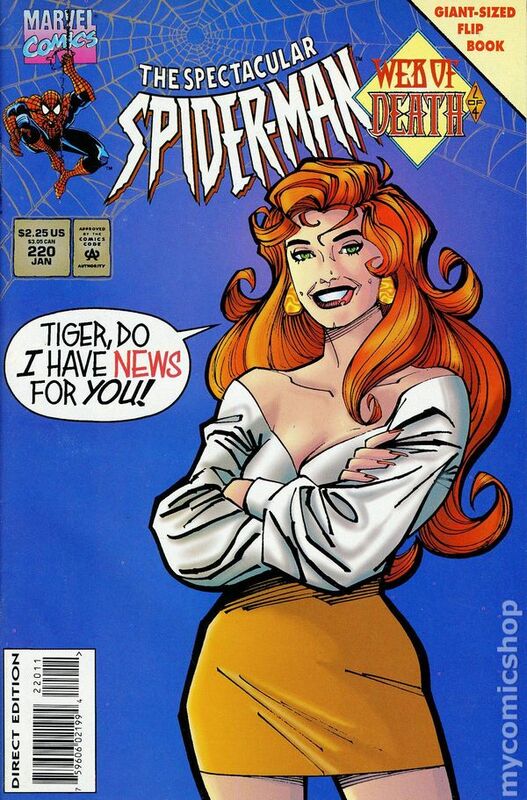 Amazing Spider-Man Annual #21 BUY The Wedding! Witness the birth of two fan favorites: Penciller Todd McFarlane makes his debut to much acclaim and the always popular Venom. Venom is Eddie Brock, a disgraced journalist during the “Death of Jean DeWolff” story who blames Spider-Man/Peter for his misfortunes. 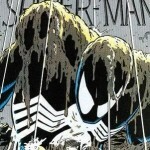 He bonds with the reject symbiote costume to create a new nemesis for Spider-Man, who also knows his secret identity. Peter’s Age: about 24 years old. While these two stories ran concurrently, they both usher in a reconfiguration of Spider-Man’s major villains and nemeses. First, Harry Osborn returns as the evil Green Goblin (in what is a personal favorite story of mine, as well as textbook example in storytelling for all creators involved). He later dies of poisoning from the goblin formula after having saved Peter. 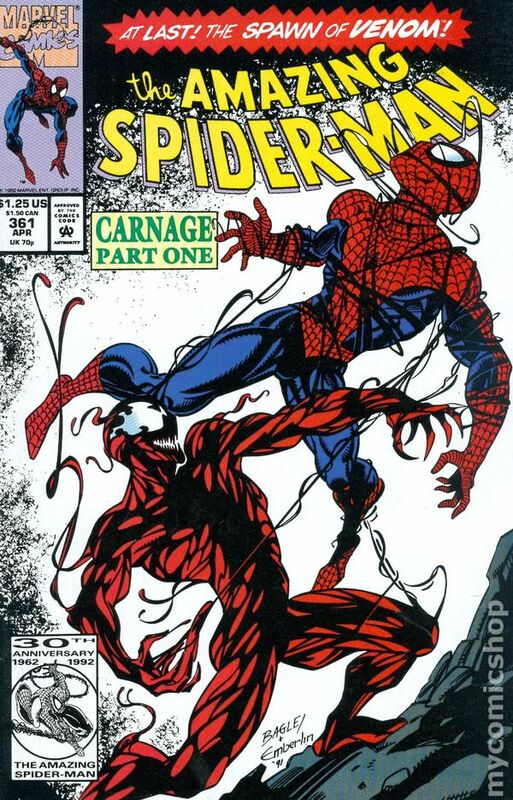 Meanwhile, with Venom continuing to be very popular, he begins to take on an anti-hero role, and Carnage, another symbiote latched onto to serial killer, steps in to the role of Spider-Man’s greatest foe. To add on some intrigue to these major developments, Peter’s parents return from the grave, revealed to have been POWs of sorts. Peter’s Age: about 25 years old. Peter’s parents are revealed to be a type of robot, implanted into his life to discover Spider-Man’s identity. 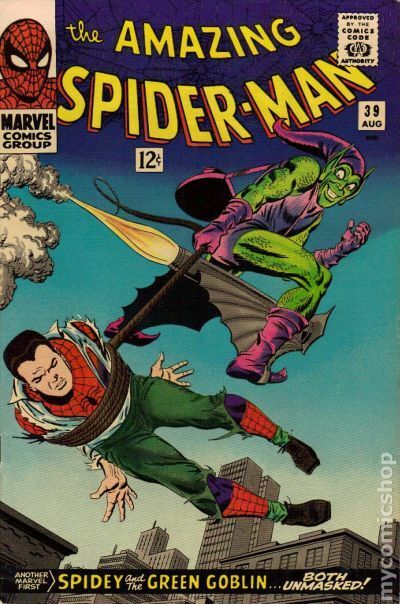 Chameleon was the villain responsible, though he was manipulated by the late Green Goblin (Harry) into this scenario. Spider-Man goes off the edge, and other events keep piling on, such as Aunt May going into a coma, which also brings his long-thought dead clone back into the picture. Mary Jane reveals she’s pregnant amid doubts over who is really the clone; Peter or Ben. 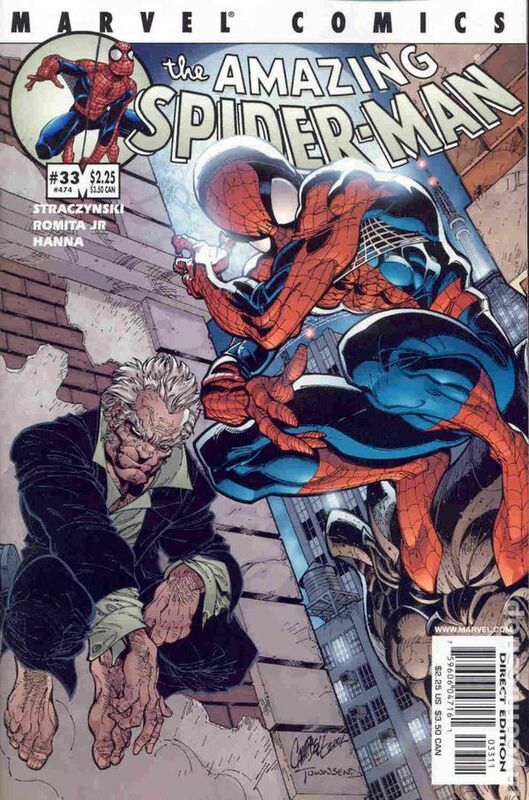 Aunt May dies and the Jackal returns to shed some more confusion over the ordeal. 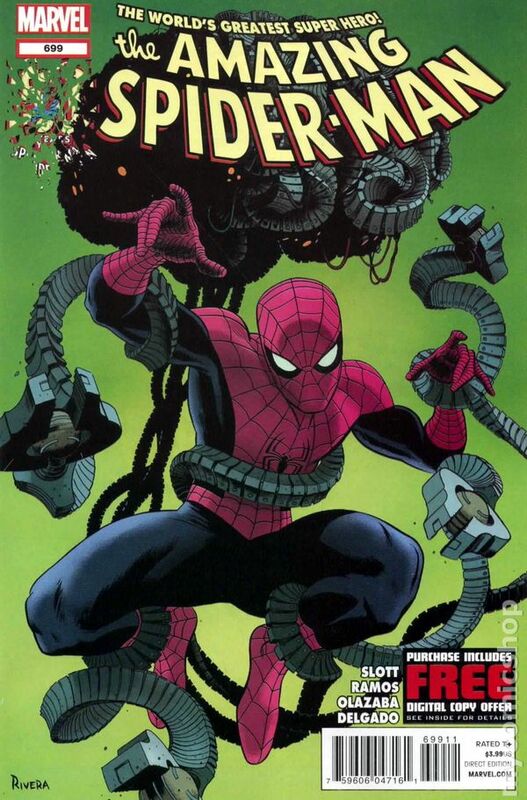 Dock Ock saves Spider-Man from a poisoning, hoping for him to be the one to kill him (revealing his identity in the process), though is killed soon after by the mysterious Kaine. It so happens this Kaine is responsible for a string of murders for which Peter is being convicted. He is revealed to be another clone of Peter, who spent much of his time trying to make life miserable for Ben Reilly, thinking Peter is actually the clone (giving at least one clone the life they want). 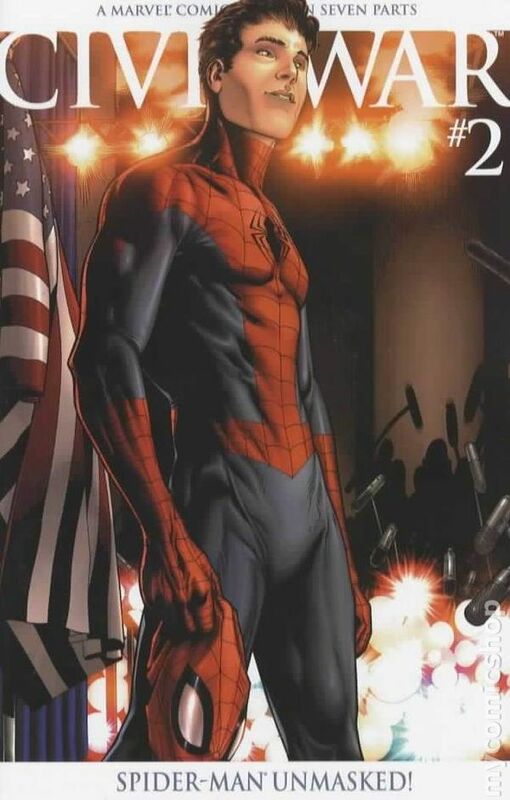 Peter is revealed to be the clone, and decides to quit being Spider-Man to raise a family, handing the mantle over to Ben Reilly, who had been operating as the Scarlet Spider. 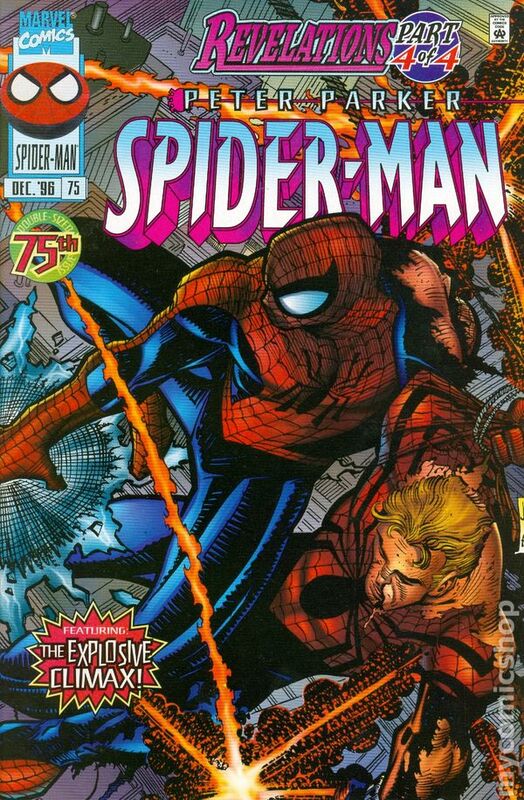 Peter does not stay gone for long as Ben Reilly takes up the mantle of Spider-Man. Peter loses his powers during his last adventure while at his new job in Portland. He returns to New York as the bones of the clone left in the smokestack are found. He starts to show signs of illness (which they believe to be clone degeneration), though it is his body regaining powers. Norman Osborn returns, revealed to not have died way back in #122, and had planned the whole clone saga all along. 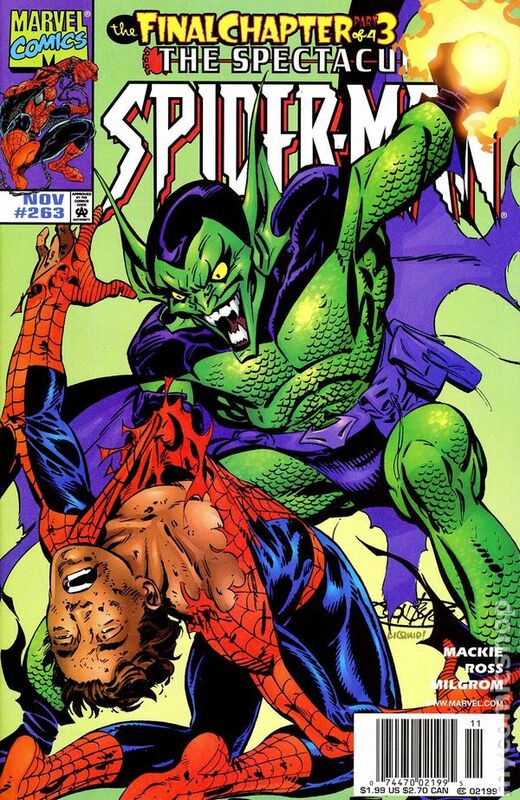 As Ben Reilly is revealed as the clone, he dies bravely in the battle against the Green Goblin. Peter takes up the mantle of Spider-Man again, though it keeps him from Mary Jane, whose baby dies during childbirth (though it is hinted to have been really kidnapped by Osborn). As Roger Stern returns years after his run to put an ending to his long running mystery surrounding the identity of the Hobgoblin. 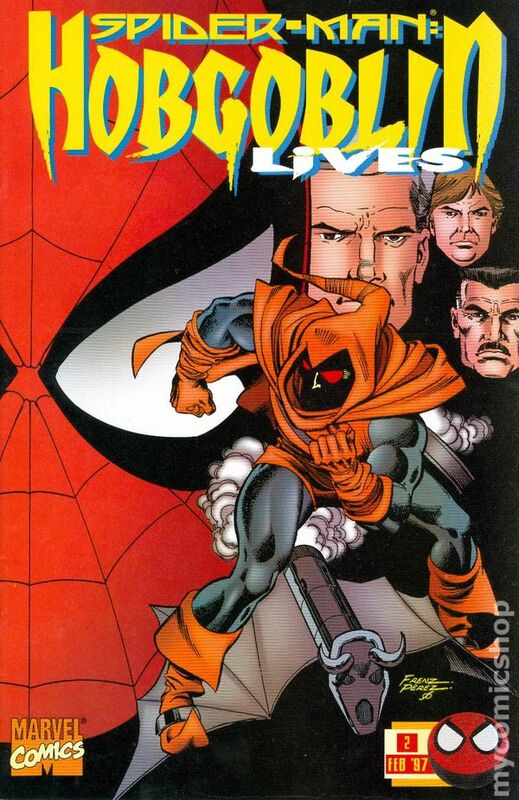 It is revealed that Roderick Kingsley, not Ned Leeds, was the original Hobgoblin. Kingsley had manipulated Leeds into thinking he was the Hobgoblin, which led to his death. This revelation now puts another classic Goblin back in play, as Kingsley is very much alive. 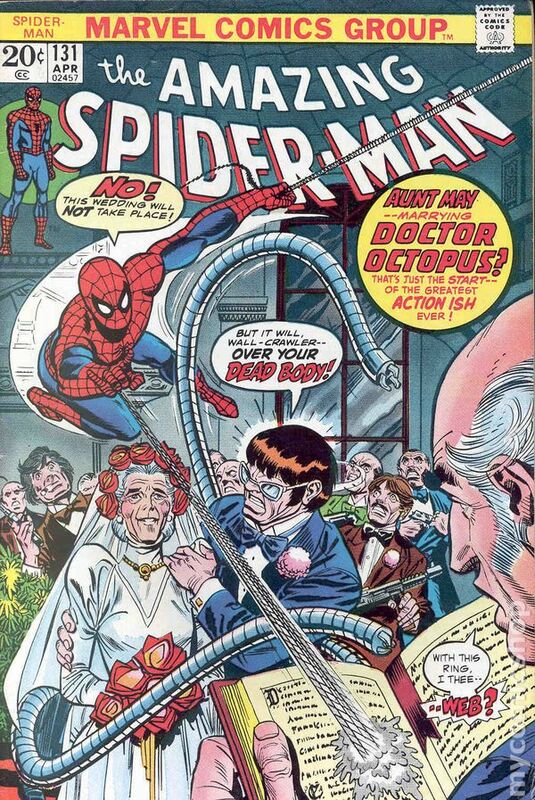 Other classic villains return as Norman Osborn purchases the Daily bugle and Doctor Octopus is revived. hint: this probably won’t stick. Peter’s Age: about 26 years old. Norman Osborn frame Spider-Man for murder. During this period, Peter takes up different identities to fool Osborn and operate without the many bounty hunters out for his head. Meanwhile, Robbie Robertson quits the Bugle under Osborn’s leadership. He begins travelling the world as a retiree as a cover to discover Osborn’s secret plan. The secret turns out that “May” is alive, and he has been holding her all this time. 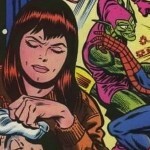 However, it is not “May”, Mary Jane and Peter’s child who they believed died at birth, but Aunt May. (The May that died in #400 was actresses planted by Osborn). Osborn collects five mystical artifacts which he hopes would give him extra power. They in fact turn him insane, and Spider-Man defeats him in a final battle, after which he quits being Spider-Man. 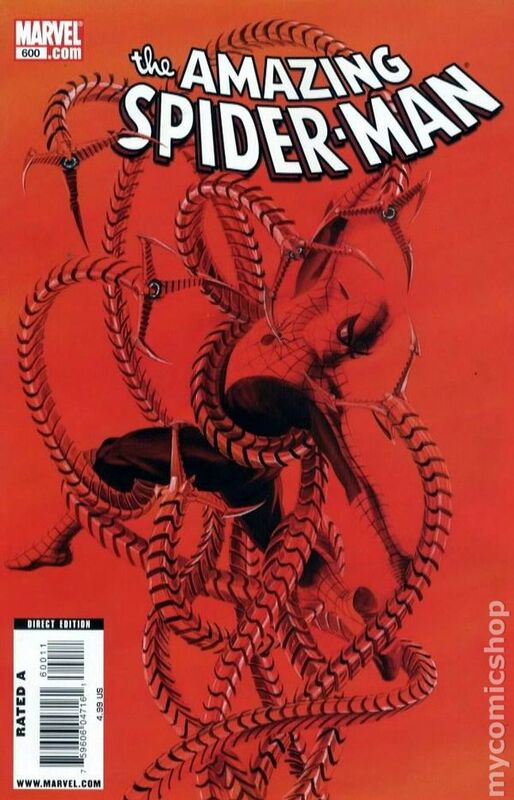 Spider-Man #98 BUY The Final Chapter, Spider-Man Quits! Peter dons his Spider-Man costume once again, which puts a strain on his and Mary Jane’s relationship. Before any reconciliation, MJ’s plan explodes. Peter strongly believes she is alive, and searches for her. MJ is in fact alive, and is being held captive by an unknown admirer. 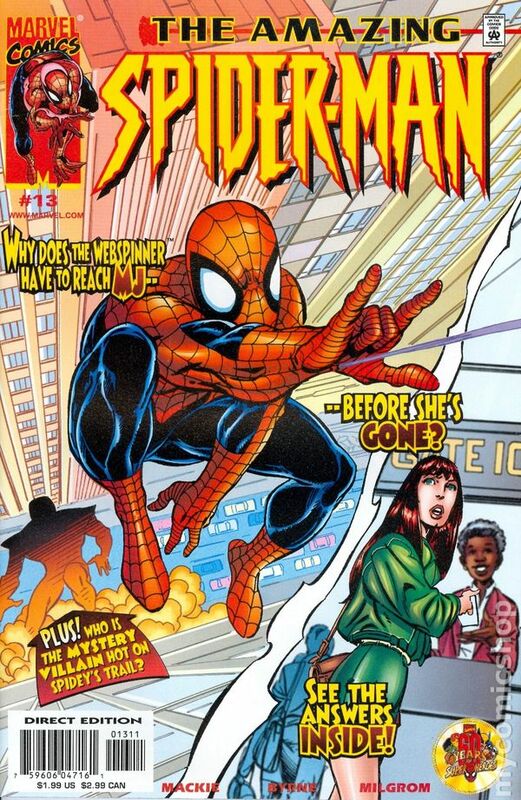 Peter saves Mary Jane, but the events demonstrated that being Spider-Man is much too dangerous for her. They split ways as she goes to pursue her acting career in Hollywood. Peter’s Age: about 27 years old. Spider-Man encounters Ezekiel, a man who believes that Spider-Man’s powers are in fact mystical, as he gained similar powers from this mystical source. Spider-Man must confront powerful new foes (Morlun, Shathra) who were destined to beat him. Ezekiel sacrifices himself to save Peter, who he had originally duped and set up for sacrifice instead of himself. Meanwhile, Aunt May discovers Peter is Spider-Man. Together, they attempt to reconcile with MJ. She eventually returns to NY to be with Peter. The Avengers have disassembled, but after helping Captain America during a breakout at the Raft, he is asked to form a new team of Avengers. He eventually moves into Stark Tower to live among the Avengers with Aunt May and Mary Jane in tow. Peter discovers he is dying, though he is really just going through a sort of metamorphosis. He dies, leaving a shell of himself behind, and emerges with new powers, such as having “stingers” shooting out of his wrists (However, these powers are seldom referenced since). 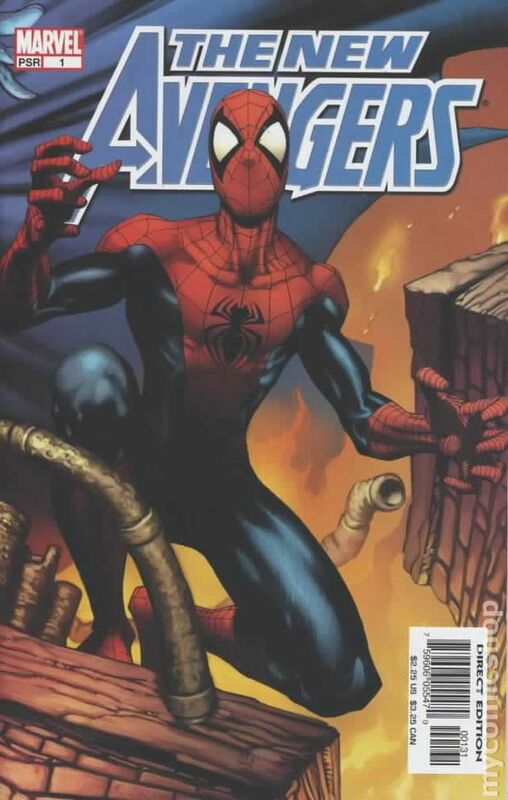 At the end of this “The Other” crossover, Tony Stark develops a new enhanced costume for Spider-Man. Peter’s Age: about 28 years old. A Civil War breaks out among Marvel’s superheroes over whether they should register publicly with the government or not. Spider-Man, on the registration side, reveals his identity to the press. 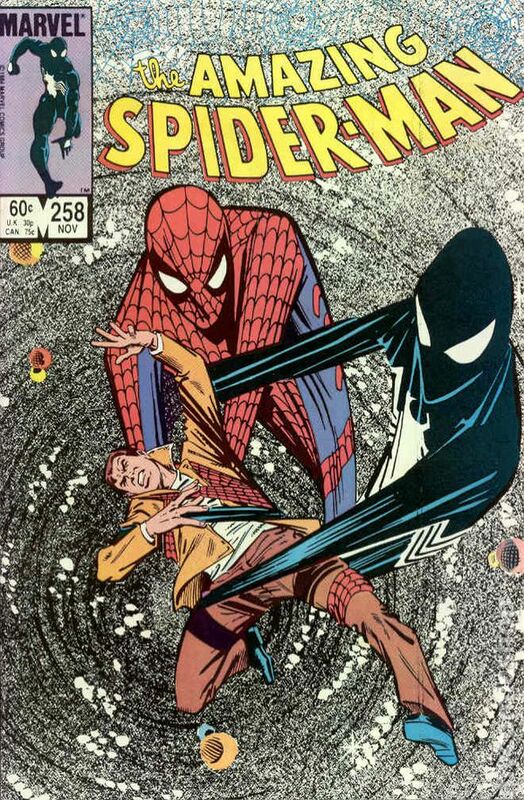 His enemies go after his family, and Aunt May is shot. This takes Spider-Man to the other side. To save Aunt May, whose misfortune stems from his revealing his identity, Peter and Mary Jane sell their marriage to Mephisto. They will not remember having been married, and part ways. After One More Day, Peter is once again single, and Harry Osborn has returned, apparently having been healing in Europe (much the same excuse as his Father’s). Speaking of, Norman takes charge of an anti-superhero team, and continues to manipulate his son. The latest new villain, Menace, turns out to be Harry’s girlfriend, and is now pregnant. Norman leads Harry to believe it is his child, though it turns out to be Harry’s. Harry takes the baby and lives life on the lam with him. Doctor Octopus returns by taking over many of the electronics in New York. 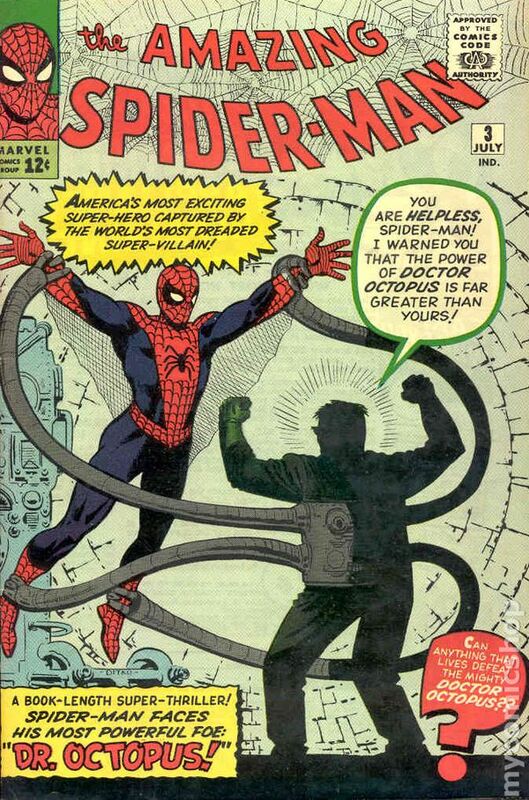 Spider-Man plugs into the system himself via a helmet designed by Doc Ock himself to shut him out. While defeated, the use of this helmet will have lasting consequences. Peter’s Age: about 29 years old. Peter gets his dream job at Horizon Labs, starts a relationship with forensic investigator Carlie Cooper and joins the Fantastic Four. Everything seems to be going right for once. Even Mary Jane has return once again to New York. However, after Marla, now-Mayor Jonah Jameson’s wife, dies during a battle, Spider-Man swears that no one dies. 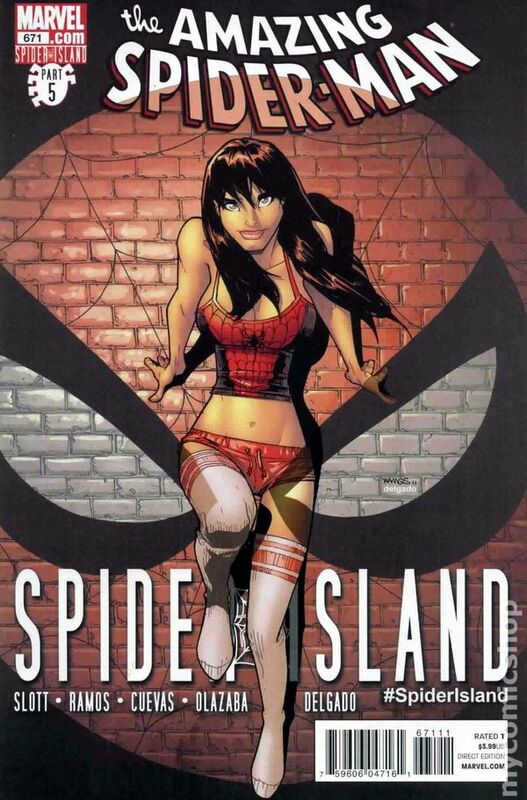 Both Mary Jane and Carlie get Spider-Powers during Spider-Island, where the newly-resurrected Jackal releases a virus that gives everyone on the Island of Manhattan Spider-Powers. Spider-Man uses Doc Ock’s helmet from #600 to help end the events of Spider-Island. When Carlie is cured (though only after turning into a giant spider), she breaks up with Peter, having deduced he is Spider-Man, and doesn’t appreciate his lie. Spider-Man, under his edict of “No One Dies”, saves Doc Ock after thwarting his final plan. Ock, who is dying from all the damage sustained over the years, is not done. He is able to access Peter’s mind because of his extended use of the helmet tech over the past few months. Doc Ock switches mind with Peter. 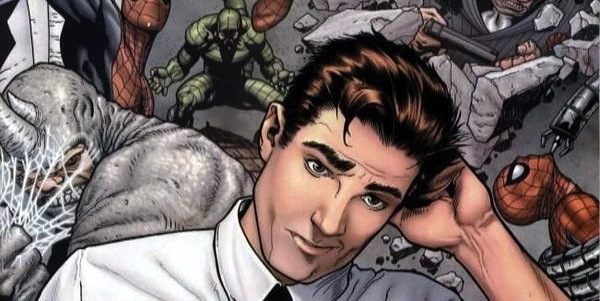 Though Peter fails to switch back and dies in Ock’s body, his conscience is still alive within his body, and his sense of “with Great Power comes Great Responsibility” resonates with Doctor Octopus’s mind. In Peter’s body, Doc Ock swears to continue using his power for good, though in a much superior way than Peter had done.